As Mitch likes to say, "Without proper education, you don't know what you don't know." Learning the basics of any trade is critical, especially when time is money. This is especially true for wood finishing. Training will shorten the learning curve, build problem solving skills rapidly and ultimately result in fewer problems. Your customized class will be designed by both of us working together towards your specific goals. One on one instruction with "hands on" learning will zero in exactly on what your immediate concerns are and how to address them. One on one sessions allow you to gain more information in a shorter period of time. Your hands on learning will produce questions that concern you and the various types of products you are finishing. How much time, energy and material waste is lost by trial and error? Not everyone learns the same way. Forty years of teaching wood finishing has taught me how to teach this trade. 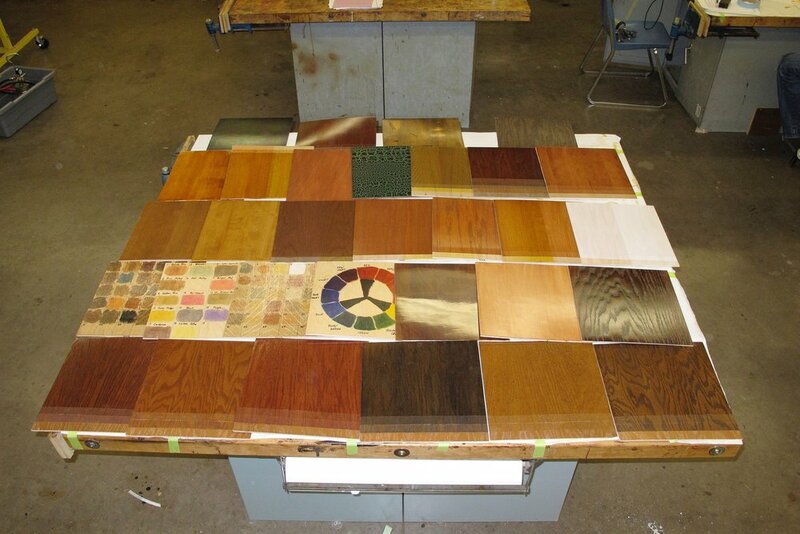 Coloring and coating applications vary, which one fits what you are doing. How Will I Benefit From Custom Education? I want you to be as comfortable with your wood finishing as you are with your woodworking. And I do not want it to take as long to learn as it did for me. For the professional or hobbyist, the basics of woodworking is the same. The same is true for wood finishing. Learn to problem solve BEFORE you have finishing problems. “IT WAS AN AMAZING OPPORTUNITY TO LEARN FROM A TRUE FINISHING MASTER. ..."ALTHOUGH IT'S NOT POSSIBLE TO COME OUT OF A TWO DAY WORKSHOP AN EXPERT FINISHER, MITCH GAVE ME A FRAMEWORK OF UNDERSTANDING THAT HAS GREATLY ACCELERATED MY LEARNING — SAVING ME UNTOLD TIME AND HAS TAKEN MY FINISHING TO A NEW LEVEL." "RECENTLY, I SPENT TWO WEEKS WITH MITCH LEARNING ABOUT SPOT REPAIR ON WOOD FURNITURE AND FOUND IT TO BE SOME OF THE BEST MONEY I'VE EVER SPENT. "BASICALLY EVERY QUESTION I HAD MITCH DIDN'T JUST ANSWER, HE EXPLAINED THE CONCEPT AND THE WHY..."